The exotic jungle of Sanjay Gandhi National Park at the outskirts of Mumbai hosts large basaltic outcrop. 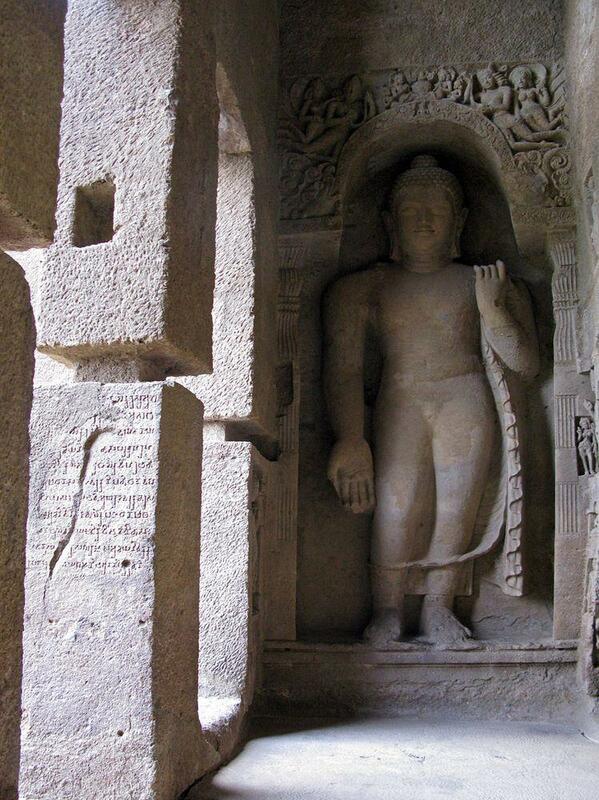 This basalt massif in contains 109 rock-cut Kanheri caves – more than 2000 years old Buddhist cells and shrines. 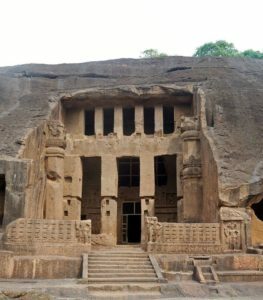 Often the description of Kanheri Caves starts with the statement that there should not be expected "other Elephanta Caves" or Taj Mahal. This is true – Elephanta Caves and Taj Mahal have absolutely different qualities. Kanheri Caves though have their own charm and most certainly – a lot more history embedded in the cliffs and a lot more influence left on the art of Asia. Word Kanheri most likely originates from Sanskrit word Krishnagiri – where Krishna means "black". This could be explained by the fact that caves were carved in a large outcrop of dark basalt in the forest of Sanjay Gandhi National Park. This ancient forest has a long and rich history of preservation. In spite of the enormous city of Mumbai encircling it from three sides, forest hosts numerous rare species including even leopards – sometimes attacking stray visitors of the park. An additional wonder of this area is created by Karvy shrub (Strobilanthes callosus (Nees)) – once per 8 years hillsides of Kanheri are covered with bright purple flowers of this plant, full with exotic butterflies. During the rainy season, several beautiful waterfalls form in Kanheri hills. The closest rim of this forest is 2 kilometers from caves. The path to the caves though is 5 km long – but it is well worth to walk it and to dive into the beauty of forest and expectation of historical gem to be learned. 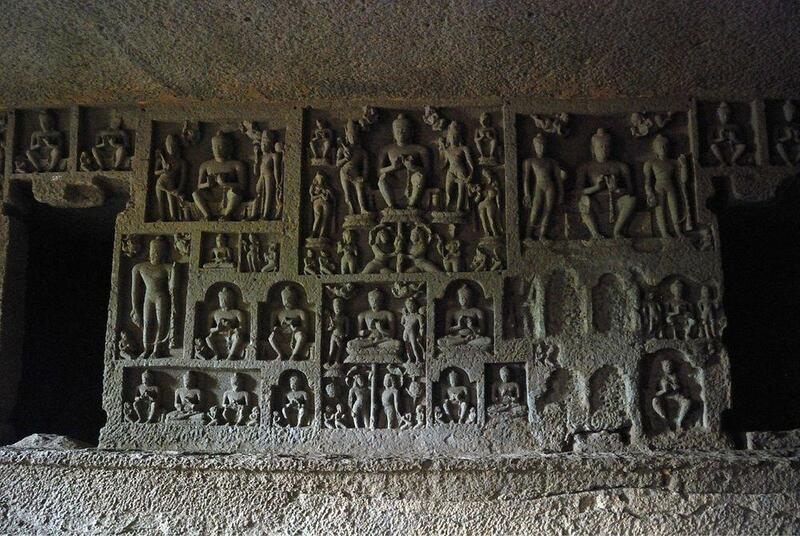 Kanheri caves are reached by an impressive, long flight of steps cut in the slope of basalt. 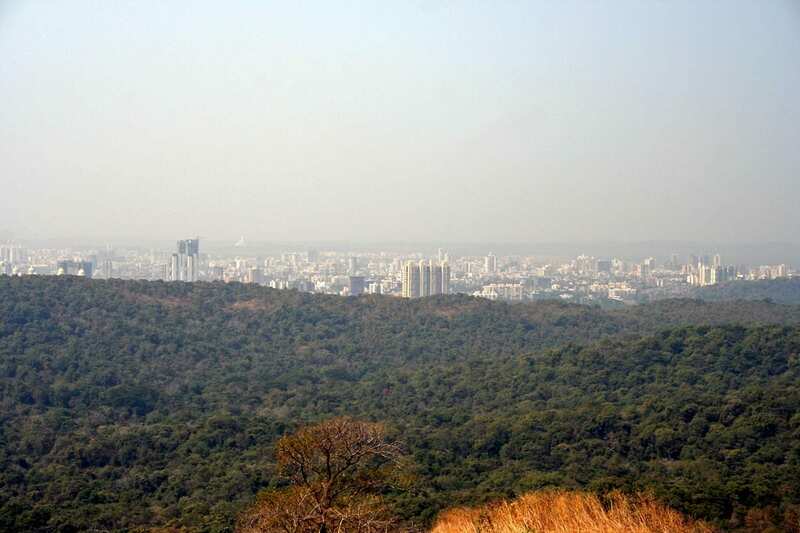 The highest caves are located up to 460 m above the sea level and there opens a panoramic view over the forest and distant blocks of apartments in Mumbai. In fact, these outskirts of Mumbai are rich with slums as well. Already buy the 4th century BC through the ancient forest there was leading a path between two busy ports – Sopara and Kalyan. Somewhat later this route was actively used by the first Buddhists known also as active traders – in fact, Kanheri Caves are signaling about the coming of Buddhism in this area. Obviously the long route and overnight stay in the middle of forest endangered the traders. Establishment of first settlements in the middle of the forest, in dark Kanheri cliffs most likely was taken as relief. 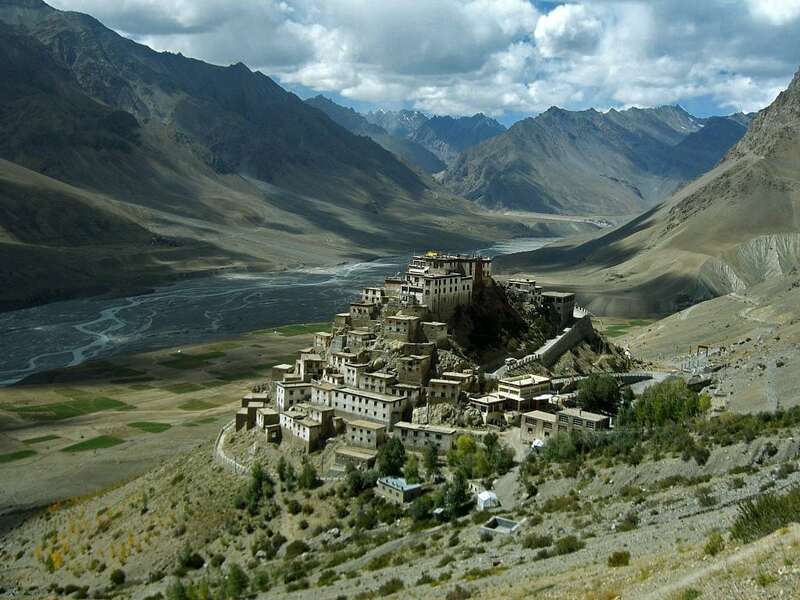 In the 1st century BC early Buddhist monks – bhiksus – established in Kanheri tiny rock-cut cells cut in the side of the hill – each with a stone splinth which served as a bed. 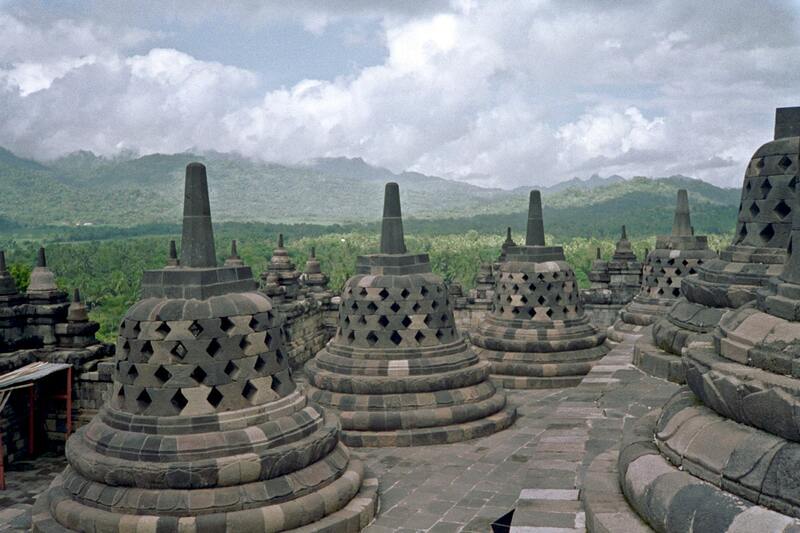 They gathered initially in larger cells and then – in congregation hall with massive stone pillars and stupa. Most likely most of them did not stay permanently here but this location already served as an inn for travelers. Also, the caves were simple and plain – as the mainstream Hinayana tradition required it. Further up the hill there was carved an ingenious system for storing water, consisting of canals and cisterns collecting rainwater into large tanks. As the community of monks grew and more and more people were living here permanently, the carving of caves became more sophisticated. Times changed and images of Buddha became popular, walls of earlier ascetic rock-cut shrines were lavishly adorned with reliefs of Buddha and Bodhisattvas. Still most of the caves have remained strict and ascetic up to this day. By the 3rd century AD Kanheri was important and influential Buddhist settlement, patronized by local rulers as testified by inscriptions on the walls of caves. Large and sophisticated works were performed by the late 5th – early 6th century when most of the famed artworks of Kanheri were created. By the times of Mauryan and Kushan empires, Kanheri was University center and the largest rock-cut cave complex in India. In the late 10th century here came Tibetan and Sumatran Buddhist teacher Atisha, he stayed in Krishnagiri Vihara and studied Buddhist meditation under Rahulagupta. 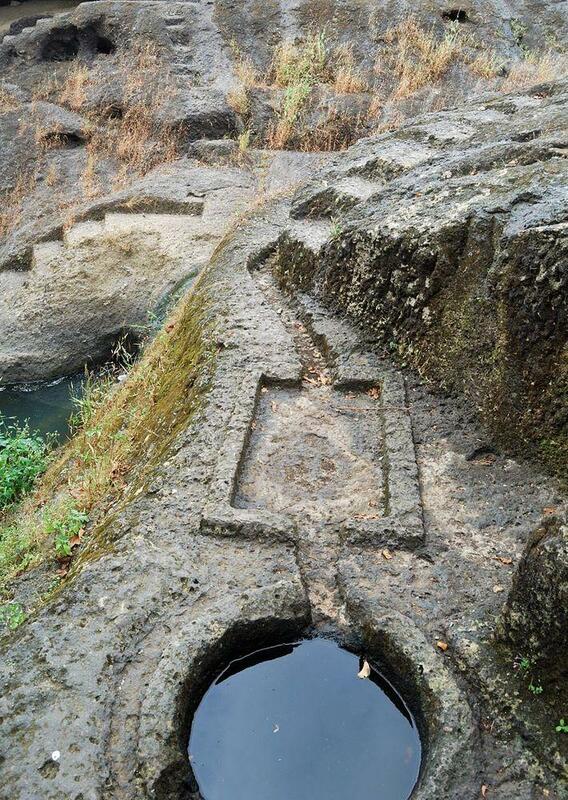 Major part of 109 caves of Kanheri are simple cells cut in basalt – viharas – cells for monks where they lived, studied, meditated. Few larger cells though are chaityas – halls for congregational worship. One of the chaityas still contains defaced woodwork on its roof. 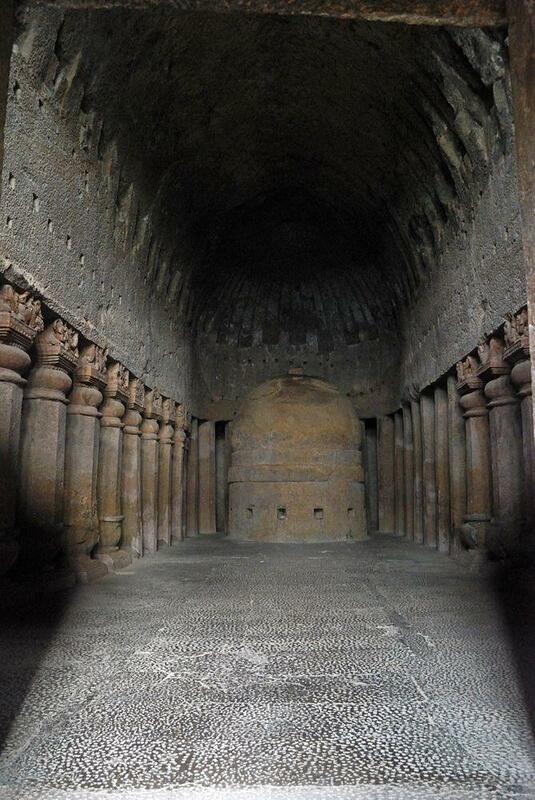 The largest and best-known monument of Kanheri – large chaitya, Cave 3 – was shaped in the late 2nd – 6th century AD. This was the latest chaitya of Hinayana branch. It is adorned with two giant, up to 7 m high figures of standing Buddhas on each side of the entrance porch. It is considered that exactly with these statues of Buddha in the 6th century there started a tradition to create colossal statues of Buddha – this tradition spread over Asia and continues up to this day. The main hall of this cave is 28 m long and 13 m wide, it is adorned with 34 columns with 5 m high stupa at the far end. Columns are adorned with elephants kneeling and worshipping the Stupa. Chaitya is adorned also with mithunas – love pairs characteristic for the art of Kushan period. At some time in the 16th – 17th century a Franciscan friar Fr. Antonio de Porto converted some monks of Kanheri to Christianity. In this period Cave 3 was converted into Christian chapel dedicated to St.Michael. No signs of this makeover remain today. Cave 11 (The Durbar Hall or the Assembly Hall) contains statue of Buddha occupying the central place of shrine. Cave contains also cells for monks. Cave 34 contains paintings of Buddha on the ceiling. Depiction of Avalokitesvara from Kanheri is especially famed – in Cave 41 this Bodhisattva is shown with eleven heads. This weird sculpture symbolically shows that 10 Bodhisattva heads lead to the final one – Buddha head thus symbolising gradual ascent to enlightement. Verandah of Cave 67 is adorned with a relief depicting Avalokitesvara flanked by two female figures. Cave 90 is famed due to the oldest preserved mandala shaped in the early 6th century AD. It is also believed that the gradually evolving art of ancient Kanheri caves has influenced the shape of magnificent Elephanta Caves nearby. Caves contain numerous inscriptions – 51 legible and 26 epigraphs, many writings still are waiting for somebody to decipher them and to find an explanation for the deciphered text. Ancient inscriptions in Brahmi script might be contemporaries of the great emperor Ashoka and his attempts to introduce Buddhism in India. Important inscriptions were found on copper plates – they testify that dynasty of Traikutas had significant influence in this part of India up to 533 AD at least. A valuable copper plate is in Brittish Museum – it contains Sanskrit inscription with the genealogy of Shilahara dynasty. In total there are known 18 such copper plates from Kanheri. Three inscriptions in Cave 90 have been written in Pahlavi. These have been left by Persian travelers who visited Kanheri twice in 1009 and once in 1021 – this means that caves were well known also in the 11th century. One inscription is significant historically as it tells about the marriage of Satavahana ruler Vashishtiputra Satakarni with the daughter of ruler Rudradaman I. This marriage did not help to prevent the expansion of Western Kshatrapas and decline of Satavahana Empire. Inscription in cave 21 refers to caves as "Krishna-saila", cave 98 – "Kanha Shele", cave 101 – "Krishnagiri". A Note on Inscriptions in Bombay, Maharashtra State Gazetteers, visited in the 23rd April 2010. Contains information on the following caves: Elephanta, Kanheri, Jogeshwari, Montpezir, Karla, Bhata dnd Bedsa caves, Ellora and Ajanta caves, Badami, Pattadkal and Aihole, Nasik caves, and Junagadh caves.